The Golden Thread - View topic - Lurkeley Hill CC 11:11? Lurkeley Hill - 11:11 Symbolism? Although it is too early for any conclusions, because there are not enough good shots available, I send you to a comparison slide of ISS station from 25.6.2007. This photo is available at NASA http://apod.nasa.gov/apod/ap070625.html. It is good to know that on June 8, 2007 a postponed assembly mission of the US Space Shuttle Atlantis STS-117 started from Florida to the ISS station. This mission was accompanied by a bad weather. Initially, it should be stared on March 15, 2007. But on the 26th February a hail storm with hails size of golf balls swept through Florida and damaged the upper part of the external fuel tank. Start was postponed indefinitely. After the repairation, start was scheduled on June 8, 2007. During the flight, the thermal protection of the shuttle has been damaged and crew had to connect to the ISS station and repair the gap by themselves. During the return flight, the mission had to be extended for one day because of the bad weather on Earth. The shuttle finally landed back on June 22, 2007 on Air Force Base in California. Looking at the crop circle it seems to me like there was also some problem. Circle, which could represent the Earth, is somehow disturbed. Re: Lurkeley Hill CC 11:11? That was weird when I took my glasses off they all looked to be EYES! looking in different directions in the circles with a saucer in the middle. Maybe each eye represents all four religions and the saucer represents them combining?!?! I think the cross with the circles is where the message is hidden. My first thoughts when I saw it was to think of the Laminin DNA molecule in a cell structure of the body. It has the function to extend/repair the DNA I think? Thanks for the zooming in, Sky. Yes, flat circles when seen close up. Laminin is defined by the Webster Medical Dictionary as a "glycoprotein that is a component of connective tissue basement membrane and that promotes cell adhesion." In other words, looking at laminin as a kind of glue isn't far from the truth. laminin enhances cell adhesion and spreading, and this provides regions of high DNA concentration between a cell and the LD-Ap surface. The present gene transferring system, which shows high efficiency and safety, would be useful in gene therapy and tissue engineering. 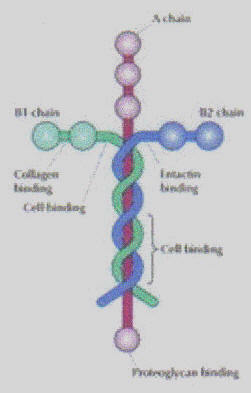 Laminin is extremely important to making sure that your overall body structures hold together. If laminin isn't produced correctly, your muscles may form improperly, giving you a form of muscular dystrophy. Or you may just fall apart in a way similar to aging, a condition called "progeria". They way I understand CC's is that there message is delivered from a HIGH vantage point. The image from a good distance is what makes the message - imo. The first image I listed above sure shows very slight impressions of eyes I guess, but they are too slight to make the point of an eye. Past CC's that depicted eyes where in clear contrast.